Registration is open! Please click here to begin. Watch the following short video to learn about our unique scheduling. Click here to view our camp catalog. Click here to request a catalog. Calling all four-year-olds for summer camp! Our Sunshine program is designed for four-year-olds. Located in a campus facility specifically designed for this age group, our youngest campers participate in activities tailored to their needs. Daily activities are designed around our weekly themes. We maximize the ‘funshine’ with daily gardening projects, arts and crafts, guest speakers, splash activities and much, much more! The Sunshine Program maintains a camper-to-staff ratio of 6:1. Campers may choose to attend either a 5-day week or 3-day (M, W, F) week program, registering for one week, or multiple weeks. *Specialty camp scheduling is not available for Sunshine Campers. The Rainbow Program is designed for children who will turn five by June 5 and will be kindergartners in the fall of 2017. Located in a campus facility specifically designed for this age group, campers participate in activities tailored to their needs. The Rainbow Program can be combined with partial-day specialty camps to create a unique schedule for your child. This program maintains a camper-to-staff ratio of 7:1. To ensure individual attention, the total number of campers does not exceed 21. Campers may choose to attend either a 5-day week or a 3-day week program. Day Camp for 6-year-olds to 12-year-olds is the anchor of CA’s summer programs and is offered for eight weeks of the summer. 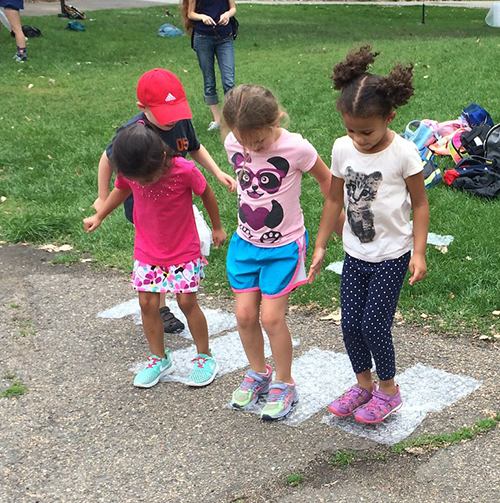 The Day Camp program is based on good old-fashioned summertime fun! Join day camp for a full day or half day. Daily activities include: adventure, archery, arts and crafts, free swim, campfire program (songs, stories, community building), group games, Red Cross-accredited swim lessons, tennis fun, rock climbing, drama and music (skits, sing a silly song, be a star at the weekly parent performance) and theme days that include a camp carnival, dunk tanks, inflatable water slides, a circus performance and more! Mix it up by adding a unique specialty camp program. In addition to our Day Camp program, we offer numerous Arts, Academics, Imagination, Sports, and Adventure camps. You can select a full-day program or combine any of our partial-day programs with a half day of Day Camp to create a completely customized schedule for your child. Prices for specialty camps vary by the activity. Join us for a fun night of games, scavenger hunts, swimming, campfire stories, songs, skits, a cookout, indoor camping, hot breakfast, and much, much, more! Available to entering 2nd-7th graders. Rainbow and purple group campers can join the overnight fun with games, scavenger hunts, swimming, movies, songs and a cookout, but get to go home and sleep in their own beds. Activities run from 3:45 p.m. until 8:30 p.m.